A geospatial analysis of historical records determined five areas of Lake Huron where missing Tuskegee and Free French aircraft were likely to have crashed. Three of the areas are within Thunder Bay National Marine Sanctuary. Map courtesy of Wayne Lusardi. Download image (796 KB). 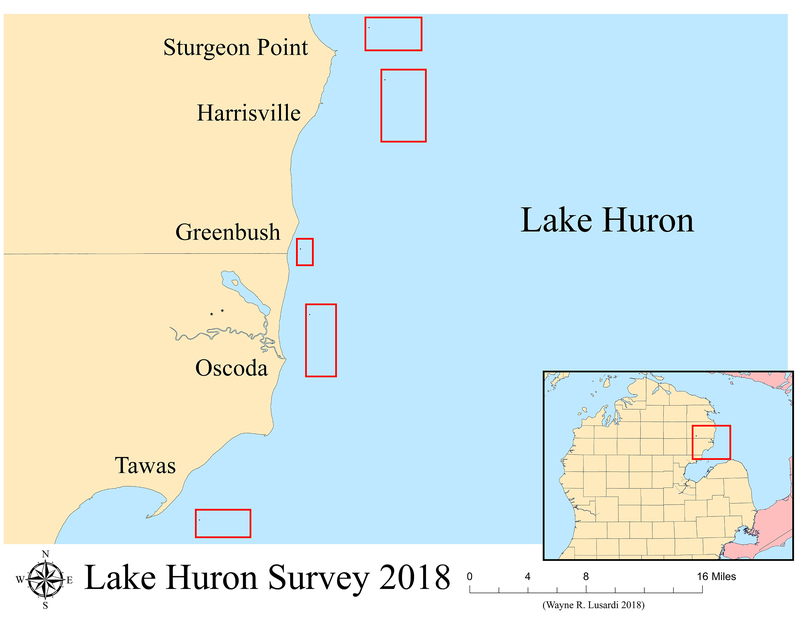 Between June 27 and September 26, 2018, a team surveyed five areas of Lake Huron within and adjacent to Thunder Bay National Marine Sanctuary (TBNMS). Through geospatial analysis of historical records, these areas were determined to be likely sites for lost World War II training aircraft. None of the five areas of Lake Huron, located off Alcona and Iosco Counties in Michigan, had been previously surveyed. R/V Storm (R5002), operated by the NOAA Great Lakes Environmental Research Laboratory, served as the primary platform to conduct the remote sensing surveys of Lake Huron. The proposed survey areas were defined using the geographic information system software ArcGIS and uploaded to the ship’s HYPACK navigational software. R/V Storm is equipped with a range of tools that were used to conduct the surveys, including a Kongsberg multibeam sonar, a Klein 3000 side scan sonar, and a Geometrics G-882 cesium-vapor magnetometer. Fifty-meter line spacing was chosen as the optimal coverage for the instruments. Archaeologists utilized NOAA’s R/V Storm, equipped with multibeam and side scan sonar and a magnetometer, to conduct a remote sensing survey of Lake Huron. R/V Storm and the U.S. Navy Sea Cadet vessel Pride of Michigan were also used to deploy divers that investigated promising acoustic and magnetic targets. Image courtesy of Wayne Lusardi. Download image (3.0 MB). 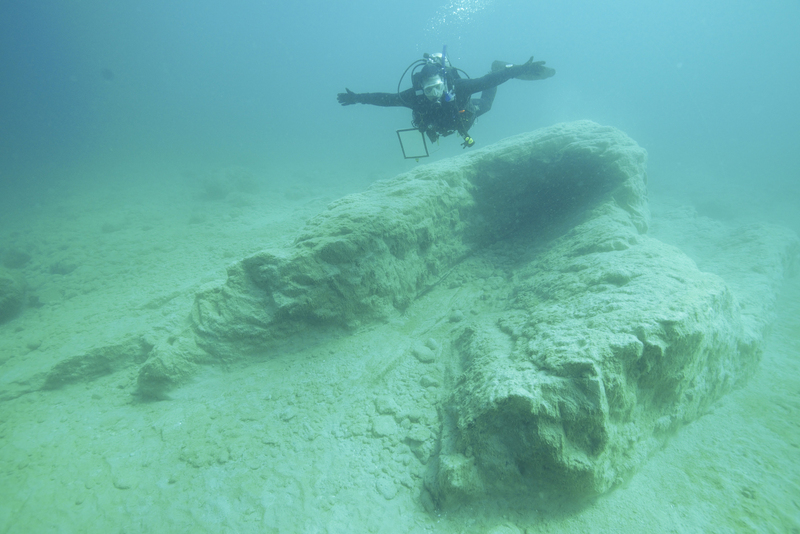 A full-time boat captain and Wayne Lusardi, the Michigan State Maritime Archaeologist, occasionally assisted by additional TBNMS staff, conducted the survey over 19 calendar days. During this period, all five areas of Lake Huron were surveyed to some extent using some or all of the remote sensing equipment on R/V Storm. A total of 583 acoustic and/or magnetic anomalies, some duplicates, were recorded during the survey. Survey Area 1 off Sturgeon Point, Alcona County, Michigan, is the location where a Republic P-47D Thunderbolt (42-74776) piloted by Free French Sgt. Francois Messinger was lost September 17, 1944. The proposed survey area comprised a rectangle 1 mile in length (northwest-southeast) by 0.75 miles in width (southwest-northeast), in water ranging from 15 to 100 feet in depth. A side scan sonar, multibeam sonar, and magnetometer survey of Area 1 was conducted on June 27-28. As no promising anomalies were located, the survey area was expanded in all directions to triple its size. After receiving local reports of possible wreckage, two smaller survey blocks were added, one off Black River north of Sturgeon Point and one immediately south-southeast of the Sturgeon Point Lighthouse. The additions were surveyed using only side scan sonar on August 7, 8, 9, 16, and 20. A total of 206 acoustic and/or magnetic anomalies were recorded in Survey Area 1. Archaeologists Wayne Lusard, Stephanie Gandulla (NOAA), and John Bright (NOAA) and volunteer divers Ernie Franklin and Justine Benanty of Diving With a Purpose used NOAA vessels and the U.S. Navy Sea Cadet vessel Pride of Michigan to dive on targets. Working on five different days in July and early August, 67 of the 206 (32.5 percent) targets discovered during the remote sensing survey were ground truthed in Area 1. The targets that were examined turned out to be glacial clay deposits or geological rock formations. Almost 600 anomalies were recorded during the remote sensing survey of Lake Huron. Most turned out to be geologic in origin. Glacial clay deposits dating from the creation of the Great Lakes were abundant and acoustically appeared as lines and angles on the lake bottom. Some of the clay features were over 60 feet in length. Image courtesy of John Bright. Download image (4.0 MB). Survey Area 2 off Harrisville, Alcona County, Michigan, is the location where a Bell P-39Q Airacobra (42-21242) piloted by Tuskegee Airman 2nd Lt. William E. Hill was lost November 22, 1943. The survey area comprised a rectangle 3 miles in length (north-south) by 2 miles in width (west-east), in water ranging from 40-80 feet in depth. A side scan sonar, multibeam sonar, and magnetometer survey of Area 2 was conducted on July 19, recording seven acoustic and/or magnetic targets. Further side scan sonar survey conducted between July 23 and July 26 identified additional targets, for a total of 132 acoustic targets in Survey Area 2. Archaeologists and volunteer divers were only able to examine nine of the targets (6.8 percent) and once again found geological rock formations or glacial clay deposits. Survey Area 3 off Greenbush, Alcona County, Michigan, is the location where a Republic P-47D-40-RA Thunderbolt (44-90339) piloted by Georgia Air National Guardsman 2nd Lieutenant Louie A. Mikell was lost June 1, 1948. The square survey area, 1 mile in length (north-south) by 1 mile in width (west-east), ranged in water depth from from 10 to 30 feet. A side scan sonar, multibeam sonar, and magnetometer survey of Area 3 was conducted on June 30 and recorded three acoustic and/or magnetic targets. Survey work resumed in late August using side scan sonar and eventually 28 acoustic targets were recorded in Survey Area 3. Out of eight targets (28.6 percent) ground truthed by divers, seven were geological rock formations. One target consisted of the ground tackle from a 19th-century vessel, including an anchor, wooden windlass, and chain. The artifacts were not associated with other wreckage and may not represent a shipwreck, but rather a loss of equipment. 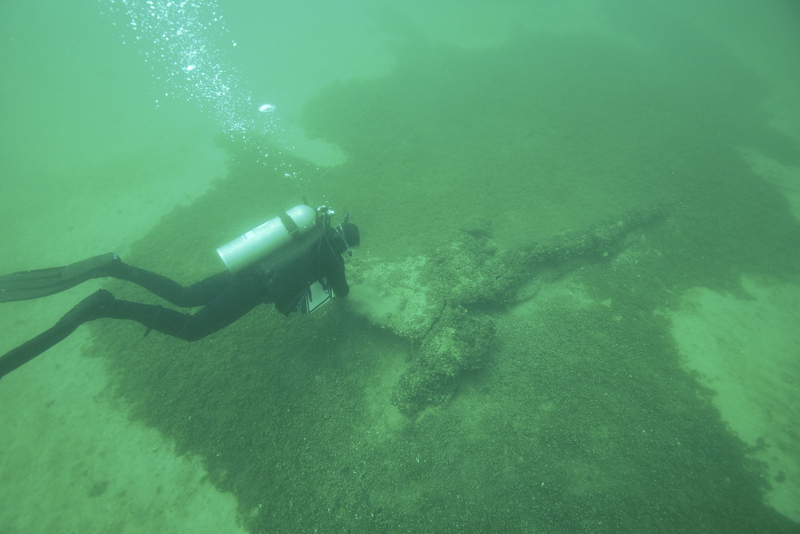 With several hundred shipwrecks still unaccounted for in the Great Lakes, it was not surprising to find historic wreckage. 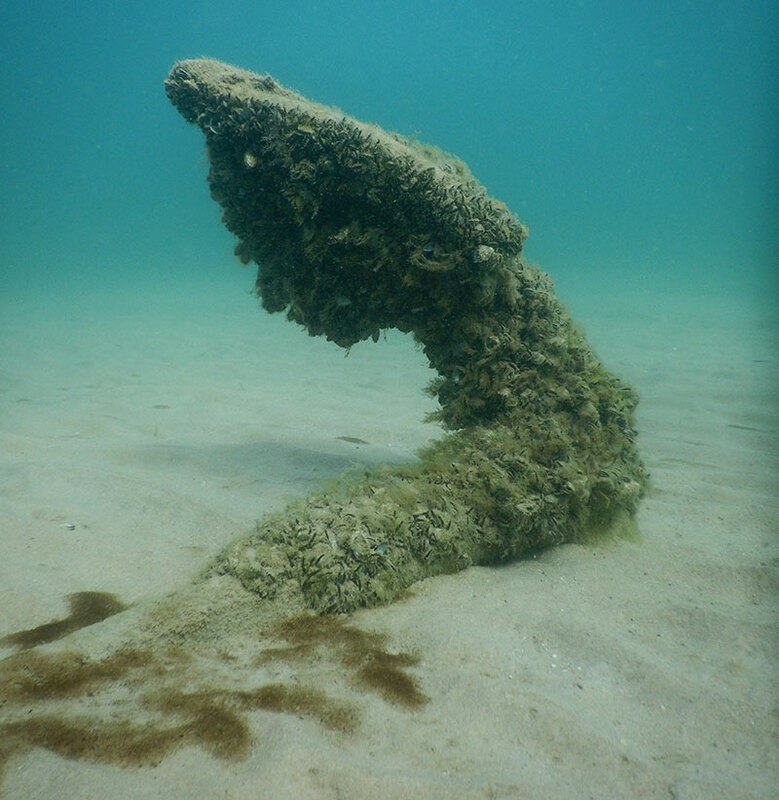 A 19th-century wooden stock anchor remains set in the lake bottom. Image courtesy of Wayne Lusardi. Download image (5.4 MB). Survey Area 4 off Oscoda, Iosco County, Michigan, is the location where a Vultee BT-13A Valiant (42-42926) piloted by Tuskegee Airmen 2nd Lt. Nathaniel Milton Hill with weather observer 2nd Lt. Luther Linson Blakeney on board was lost June 16, 1943. The search area may also be the location of a U.S. Air Force Lockheed F-94C-1-LO Starfire (50-1059), lost March 16, 1957, with Lt. Nicolay and Lt. Lewis on board. The survey area comprised a rectangle 4 miles in length (north-south) by 2 miles in width (west-east), in water ranging from 20 to 70 feet in depth. Side scan sonar survey conducted between September 11 and September 14 recorded 98 acoustic targets. The survey area was only partially completed and will require additional remote sensing next season. Diving off R/V Storm, archaeologists Wayne Lusardi and Stephanie Gandulla (NOAA) investigated three targets (3.2 percent), all of which were geological rock formations or glacial clay deposits. 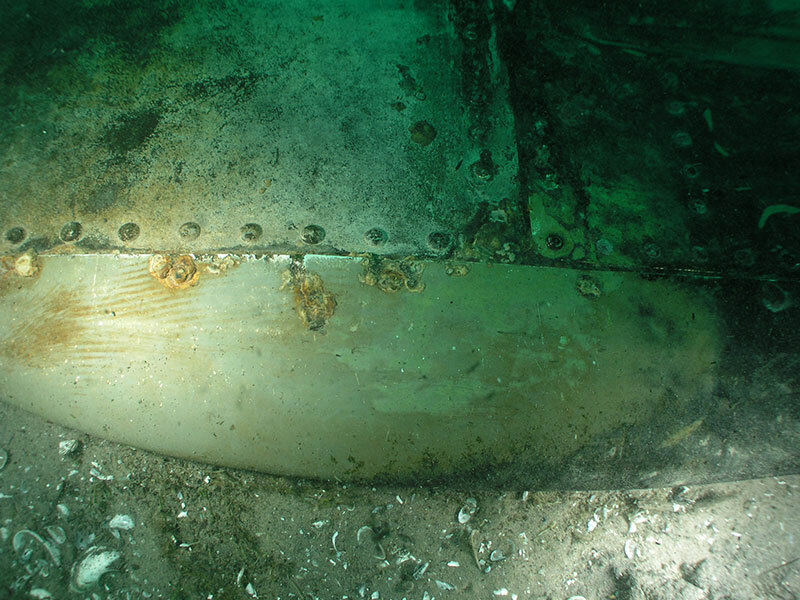 Michigan State Maritime Archaeologist Wayne Lusardi investigates the only aircraft found during the survey, a military tow target from the 1950s. Image courtesy of John Bright. Download image (5.4 MB). Survey Area 5 off East Tawas, Iosco County, Michigan, is the location where a Curtiss P-40F Warhawk (41-13655) piloted by Tuskegee Airman 2nd Lt. Wilmeth W. Sidat-Singh was lost May 9, 1943. The survey area comprised a rectangle 2 miles in length (northeast-southwest) by 1.5 miles in width (northwest-southeast), in water ranging from 40 to 80 feet in depth. A side scan sonar, multibeam sonar, and magnetometer survey of Area 5 was conducted on June 28 and resulted in the recording of 40 acoustic and/or magnetic targets. The survey continued using side scan sonar in late September, but did not complete the coverage of Area 5; additional remote sensing next season will be required. A total of 124 acoustic targets were recorded. 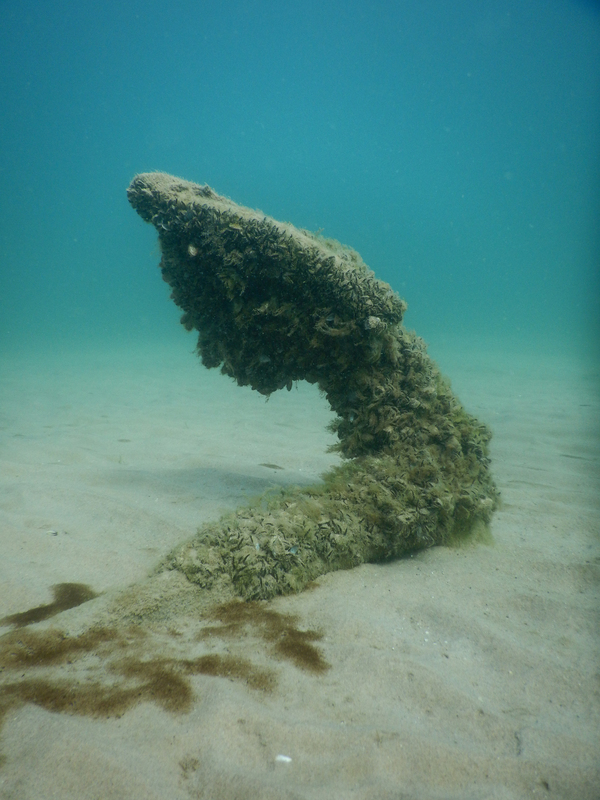 Diving off R/V Storm, archaeologists Wayne Lusardi, John Bright (NOAA), and Stephanie Gandulla (NOAA) investigated several targets in close proximity that turned out to be a military tow target manufactured in 1956 by Schweizer Aircraft Corporation of Elmira, New York. 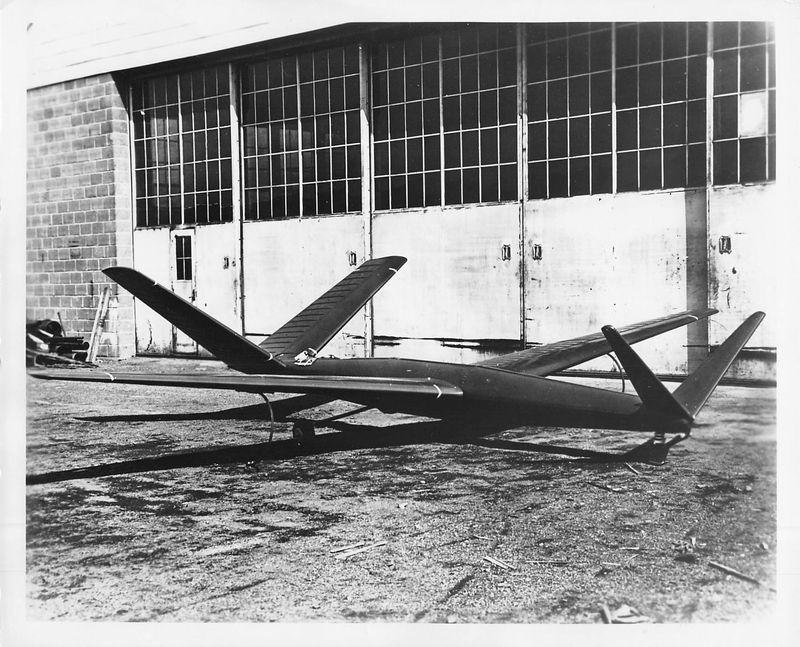 Positive identification of the Aero X-27A was made following recovery of the aircraft data plate. Targets like the Aero X-27A were towed using piano wire several thousand feet behind jets and used for target practice over Lake Huron. The aluminum targets replaced the old style cloth banners used over the lake beginning in World War I. 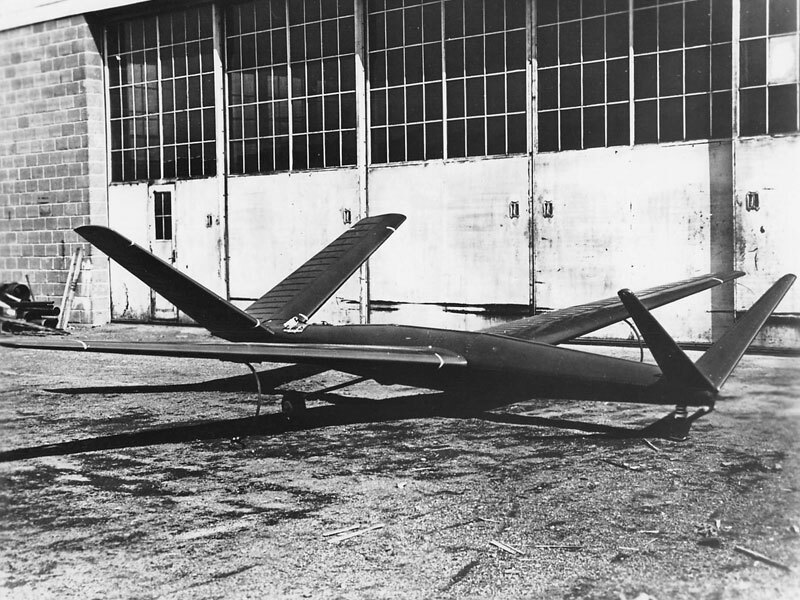 The Aero X-27A tow target more closely simulated aerial combat and could be landed to assess the number of successful hits. The found wreckage is broken and largely buried in soft sediments. It retains its original red paint on the fuselage and variable pitch wings. Only five of the 124 (4.0 percent) targets were ground truthed in Area 5. Schweizer Aircraft Corporation of Elmira, New York manufactured 400 tow targets for the U.S. Navy in the 1950s. How this particular target ended up in Lake Huron is unknown. Image courtesy of Paul Schweizer. Download map (jpg, 1.1 MB). The tow target’s wingtip. Image courtesy of Wayne Lusardi. Download larger version (jpg, 1.3 MB). Three of the five areas (Survey Areas 1, 2, and 3) were entirely surveyed. Areas 4 and 5 require additional work to complete the surveys. With the exception of the military tow target from the 1950s and 19th-century ground tackle that does not appear to be associated with a shipwreck, all ground truthed targets are geological rock formations or glacial clay deposits. However, the fact that divers have not yet located aircraft wreckage does not mean that wreckage was not detected during the survey. Only a small percentage of targets were examined due to limited time available for diving. Additional targets may also be identified when data are more thoroughly analyzed following the completion of the 2018 field season, and more targets are likely to be recorded during future remote sensing. The method for locating and ground truthing targets in 2018 consisted of taking position coordinates from geo-tiff images of targets. These georeferenced images were created in ArcGIS from unprocessed remote sensing data. The position coordinates were put into the boat’s GPS to mark the target location with a buoy, followed by sending divers down to visually survey the area. Digital imagery and video was recorded on most targets. Late season visibility in Lake Huron was reduced because of algae blooms in warmer water, making individual searches more time consuming. Post-processed images, more accurate coordinates, and clearer water in spring and early summer will expedite the locating of targets.